Picture this, your brand new laptop or desktop computer runs into a fatal error just a few weeks after purchase, and you don’t have the Windows installation disc. What do you do then? Most new computers don’t come with optical media anymore, and in case of emergencies, it’s not always feasible to download and burn a copy of the operating system from another computer. Thus, recovery drives! These handy little tools let you recover your operating system with minimum fuss and can be carried around anywhere. All you need is a computer that’s running the OS you want to create a recovery drive for, and a USB drive, preferably with a capacity of 8 GB. Windows 7, however, didn’t allow USB recovery drives and only supports recovery discs, which we will also cover. Windows 8 and above, can do both. With a recovery drive or disc, you can start afresh anytime your computer runs into problems. Windows files corrupted? Registry busted? No boot up? Need to start over? You can solve these and many problems by creating a Windows recovery drive. It’s always better to be prepared, and it won’t take too long either, here’s how to create a Windows recovery drive! Step 1: Go to the Control Panel. 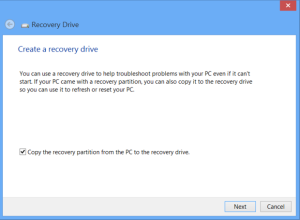 Step 2: Click “Recovery” and then select “Create a recovery drive”. Step 3: At the first screen, click Next, and if your computer came with a recovery partition, you can copy that to the USB drive as well. However, this will take up much more space. Step 4: Select the USB drive you want to use as a recovery drive and click next. Note that all other data will be erased from it. Step 5: You may be asked if you want to delete the system recovery partition, we recommend you keep it. And you’re done! Step 1: Go to the Start Menu and type “recdisc”, then press enter. Step 2: In the new dialog, select the disc drive where you have an empty disc inserted and click “Create Disc”. That’s it! Step 1: Go to the Control Panel and click “System and Maintenance”, then select “Backup and Restore”. 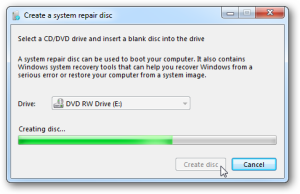 Step 2: Click “Create a System Repair Disc” on the left side of the window. Step 3: In the new dialog, select the disc drive where you have an empty disc inserted and click “Create Disc”. That’s it! It’s just that easy, so we recommend everyone to have a recovery drive or disc ready in case of emergencies. Using it is pretty simple as well, you can simply boot from it, or insert it when prompted to get everything up and running again. If you have any questions regarding the process or need any help using the recovery media, don’t hesitate to reach out to us via the comments below! 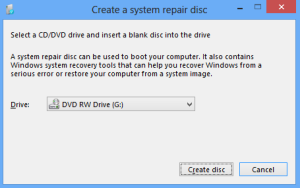 How to use a Recovery Disk on my laptop? Can you please guide me for further assistance? Have you tried the instructions above? Are you facing any issues?